Her, a memoir by Christa Parravani was absolutely stunning. Stunning in the most messed up way. Stunning in how I had to read parts of it out of the corner of my eye because I simply couldn’t deal with it. There is so much emotion and pain and grief and sickness and just . . . humanness. 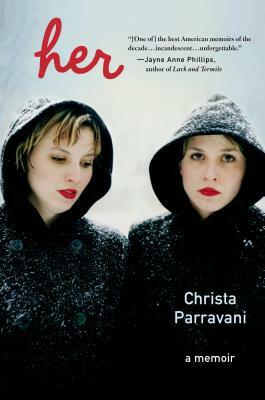 The worst side of humanness.This is a memoir about Christa and her identical twin sister, Cara, who tragically died as the result of an overdose. There’s a lot more going on though than just a tale of one drug-addicted twin and her sister. I have always been sympathetic to those who struggle with addiction – probably because I am myself a recovering alcoholic – but this is a story that really gets to the heart of what we run from when we run with drugs and/or alcohol. I don’t want to say too much about the content of the plot, but I will say that the pacing was excellent, the writing tight, and the story very affecting. You know from the first few pages that Cara dies, but then we’re taken back a number of years to watch her decline. As the time of her death neared I found it harder and harder to read. When I finally got to the chapter where Cara’s death was described, I had to put the book aside for a few days before I could read it. I just wasn’t ready to lose her yet. I felt such genuine sadness for this girl, and for her sister who was completely lost without her twin. This book is not recommended for those who like to read as an escape, because it will make you uncomfortable and sad and angry and any number of other emotions. I would highly recommend it to many other people though, including those who are interested in addiction, twins, and/or hauntingly beautiful tales. If you are the type who likes to read a memoir and feel as though you’re reading someone’s diary and their innermost thoughts, then this is a book you should run out and get. This entry was posted in book reviews, books, fiction, memoir, non-fiction and tagged book review, books, memoir, non-fiction, parravani. Bookmark the permalink.